Our pets are the sunshine of our lives. Their affection, their love, and sometimes, just them being themselves, light up our entire day. But there are moments when even these love- showering creatures do not come to terms with us. 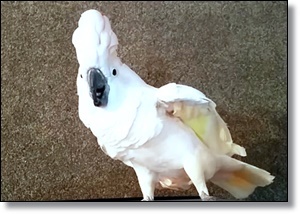 Just like this cockatoo, who, in the video below, is not just upset from her dad. She is so furious that she can be heard swearing all her anger away. Pebble, an angelic looking bird, is a beautiful cockatoo who seems to be very calm. However, the reality is far from that. She seems to be completely unable to express her anger vocally. Recently, Pebble’s dad had asked her to get inside her cage, which she clearly wasn’t happy about. That is why she started swearing her heart out at him. As she screamed the nasty words, she flapped her wings and puffed her crest to make sure her dad notices her rage.